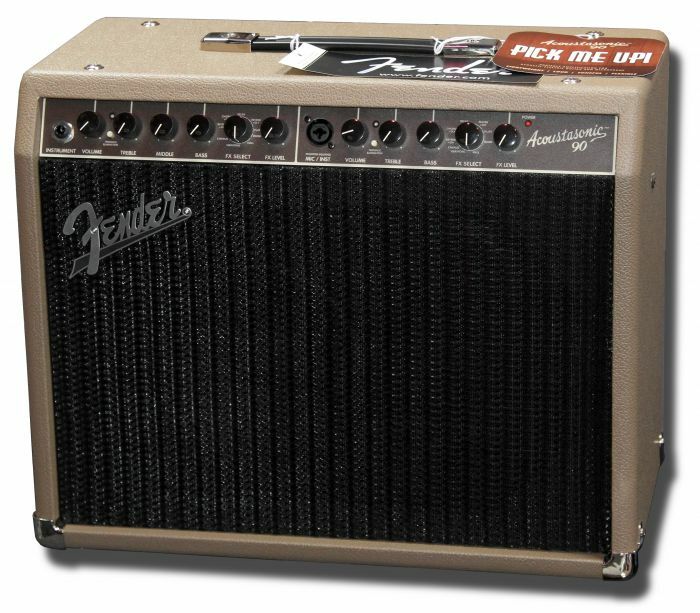 The Fender Acoustasonic 90 is perfect for the acoustic guitarist who needs compact, powerful and affordable amplification. With its 90-watt power amp, 8” cloth-surround low frequency woofer and high-frequency tweeter, it packs stage-worthy performance into a lightweight combo weighing only 18 lbs. The Acoustasonic 90 also delivers a wealth of other versatile features, including instrument and microphone channels with independent tone and effects controls; smart feedback elimination circuit with on/off switch for each channel; studio- quality effects including reverb, echo/delay, chorus, Vibratone and more; XLR line output with ground lift; auxiliary input external media player use; strong but lightweight five-ply hardwood construction; and a classic Fender look with brown textured vinyl covering, black grille cloth and chrome hardware. Optional two-button effects-select footswitch also available.